Here’s a short list of new(ish) books focusing on embodied cognition, phenomenological psychiatry, and theory of mind. Removing our human-centered spectacles, Louise Barrett investigates the mind and brain and offers an alternative approach for understanding animal and human cognition. Drawing on examples from animal behavior, comparative psychology, robotics, artificial life, developmental psychology, and cognitive science, Barrett provides remarkable new insights into how animals and humans depend on their bodies and environment – not just their brains – to behave intelligently. . . . Arguing that thinking and behavior constitute a property of the whole organism, not just the brain, Beyond the Brain illustrates how the body, brain, and cognition are tied to the wider world. 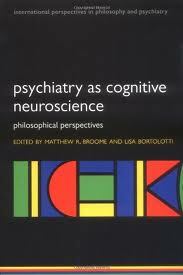 Psychiatry as Cognitive Neuroscience includes chapters on the nature of psychiatry as a science; the compatibility of the accounts of mental illness derived from neuroscience, information-processing, and folk psychology; the nature of mental illness; the impact of methods such as fMRI, neuropsychology, and neurochemistry, on psychiatry; the relationship between phenomenological accounts of mental illness and those provided by naturalistic explanations; the status of delusions and the continuity between delusions and ordinary beliefs; the interplay between clinical and empirical findings in psychopathology and issues in moral psychology and ethics. Theory of mind, or “mindreading” as it is termed in this book, is the ability to think about beliefs, desires, knowledge and intentions. It has been studied extensively by developmental and comparative psychologists and more recently by neuroscientists and cognitive psychologists. This book is the first to draw together these diverse findings in an account of the cognitive basis of “theory of mind”, and establishes the systematic study of these abilities in adults as a new field of enquiry. 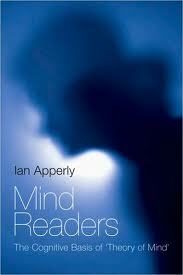 Apperly focuses on perceptions, knowledge and beliefs as paradigm cases of mindreading, and uses this as a basis from which more general lessons can be drawn. The book argues that an account of the cognitive basis of mindreading is necessary for making sense of findings from neuroscience and developmental and comparative psychology, as well as for understanding how mindreading fits more broadly into the cognitive system. It questions standard philosophical accounts of mindreading, and suggests a move away from the notion that it consists simply of having a “theory of mind”. This entry was posted in challenges of interdisciplinary research, embodied cognition, philosophy and psychiatry, theory of mind by Constance A. Cummings. Bookmark the permalink.